Donald Trump has an unusual proposal for CNN: He wants the network to donate its profits from next week's Republican primary debate to charity. "I believe that all profits from this broadcast should go to various VETERANS groups, a list of which I will send to you in the near future," the GOP frontrunner said in a letter to CNN Worldwide president Jeff Zucker. 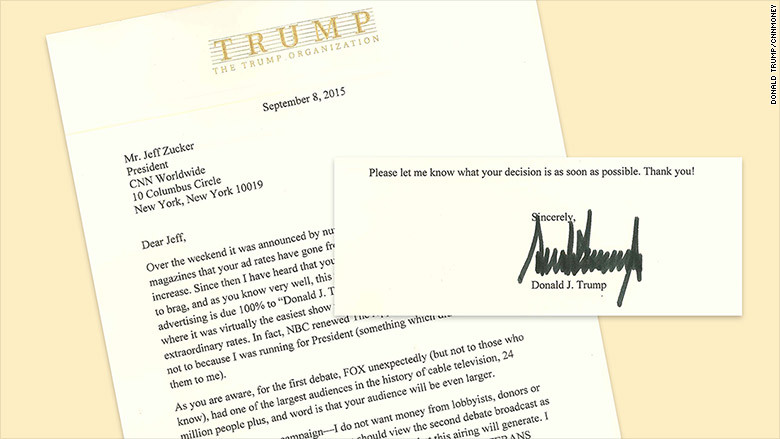 Trump published the letter on Wednesday morning. He said he's responsible for an expected spike in advertising revenue from the September 16 event. The first debate of the season, on August 6, drew 24 million viewers to Fox News, by far the biggest audience for a primary debate. "While I refuse to brag, and as you know very well, this tremendous increase in viewer interest and advertising is due 100% to 'Donald J. Trump,'" Trump wrote. A CNN spokeswoman declined to comment. There is no precedent for the kind of financial transaction Trump is suggesting. But there's also no precedent for a candidate like Trump. The billionaire businessman dropped hints last month about this donation proposal. He told Time magazine, "Here's my question: So if I go to CNN and I say, Look, you're going to have a massive audience, and if I say to them, I want $10 million for charity, nothing for myself, what happens? I'm not showing up, right?" Trump suggested that he could say to CNN: "I'm not showing up unless you give $10 million to cancer, to this, to that. You pick 10 great charities, $1 million per." He also mused that he should be paid to show up for interviews. "They should all pay me for this," Trump told The Hollywood Reporter in August. "I'm doing this for nothing." Television networks, however, generally do not pay for interviews or debate participation. Any payment from a media company to a candidate (or on behalf of a candidate) would raise all sorts of red flags, from basic journalistic questions about fairness to legal questions about political donations. CNN has not said how much it is spending to produce the debate, nor how much it is charging advertisers.